I think the hostess for Tuesday Couch Potatoes is out of time so, she is not around to visit the entry. Anyhow, as loyal couchers I still want to post my entry for the 6th edition of TCP which is all about Angels. Any movies that has angel in it. 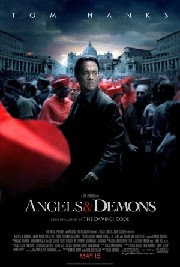 My pick would be the 2009 movie Angels and Demons with stars Tom Hanks and Ewan McGregor. Synopsis: The story of Langdon's brush with a shadowy secret society, the Illuminati, and his frantic quest for the world's most powerful energy source, in the... The story of Langdon's brush with a shadowy secret society, the Illuminati, and his frantic quest for the world's most powerful energy source, in the company of a beautiful Italian physicist whose father, a brilliant physicist, has been murdered. Hindi ko pa napapanuod ang pelikulang ito pero mukhang maganda base sa pagkakakwento mo. Kapag showing na dito o makakita ako nito sa dvd ay panunuorin ko rin ito. Thanks for your post. God bless you all always. like this movie, very gud kaau si ewan mcgregor..